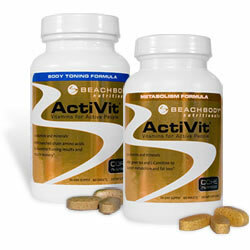 ActiVit Body Toning Formula is a multivitamin that is 100% natural, safe and effective. 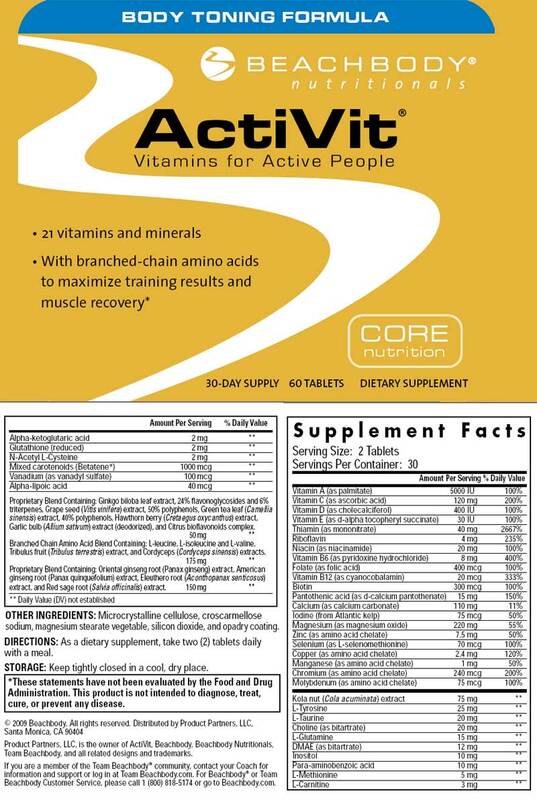 This multivitamin will give you maximum results and enhance your fitness training experience. ActiVit Body Toning Formula is the perfect multivitamin to provide your body with the nutrients to endure and succeed at Slim in 6, Power 90 In Home Bootcamp, 10-Minute Trainer or any Beachbody fitness program. Even if you are not exercising, this multivitamin will nourish your body and give you maximum energy to keep up with you active lifestyle! What's the difference between ActiVit Metabolism and ActiVit Body Toning Formula? ActiVit Metabolism and Body Toning Formula share the same purpose: to help you reach your fitness goals, to help you stay healthy and maximize your weight loss. The difference is the additional ingredients and the additional benefits. Besides the 20 essential nutrients that will boost your energy and help you feel better during your workouts, ActiVit Body Toning Formula contains L-Glutamine, which helps restore energy and repair and build lean muscle. ActiVit Body Toning supports endurance, muscular strength, and recovery time and it also includes important health-promoting nutrients and protective antioxidants like green tea, grape seed extract, and ginkgo biloba. ActiVit Body Toning's unique formulation with the highest quality vitamins will either increase energy and stamina or allow muscles to perform more efficiently. Get the proper nutrients your body requires. This safe and natural supplement will help you feel great on the inside and look great on the outside!